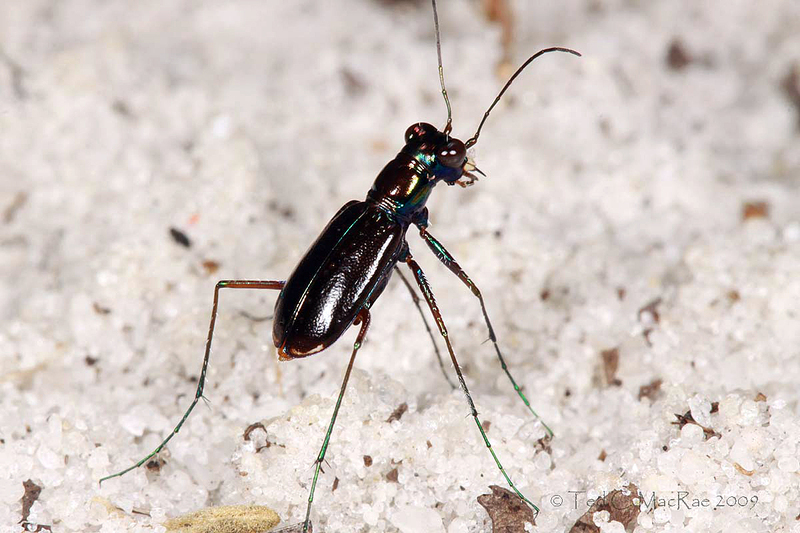 When my wife and I made plans to spend a week at her sister’s condominium in Florida this past summer, I began making a list of the tiger beetle species that I wanted to see. I would be happy to see anything, since I had never before tiger beetled in Florida, but early August was looking to be on the late side for many things. In addition, since this was a family vacation, I would only have a couple days at most to sneak off on my own and immerse myself in bug hunting. All this meant that I would have to be very judicious about where I went and what I looked for. I sought advice from a few other cicindelophiles on species and localities, and by the time we made the 16-hour drive from St. Louis to Seminole (near St. Petersburg) I had settled on two destinations—the Lake Wales Ridge of central Florida to look for Cicindela highlandensis (Highlands Tiger Beetle), and the so-called “Road to Nowhere” near Steinhatchee where as many as 10 species of tiger beetles can be seen when the season is right. Things started out well when, before even looking for any of these species, I stumbled upon Ellipsoptera marginata (Margined Tiger Beetle), its sibling species E. hamata lacerata (Gulf Beach Tiger Beetle), and some 3rd-instar larvae in their burrows that proved to be the Florida endemic Tetracha floridana (Florida Metallic Tiger Beetle) in the small coastal preserve just outside the back door of my sister-in-law’s condo. The big target of the trip, however, was not so straightforward. 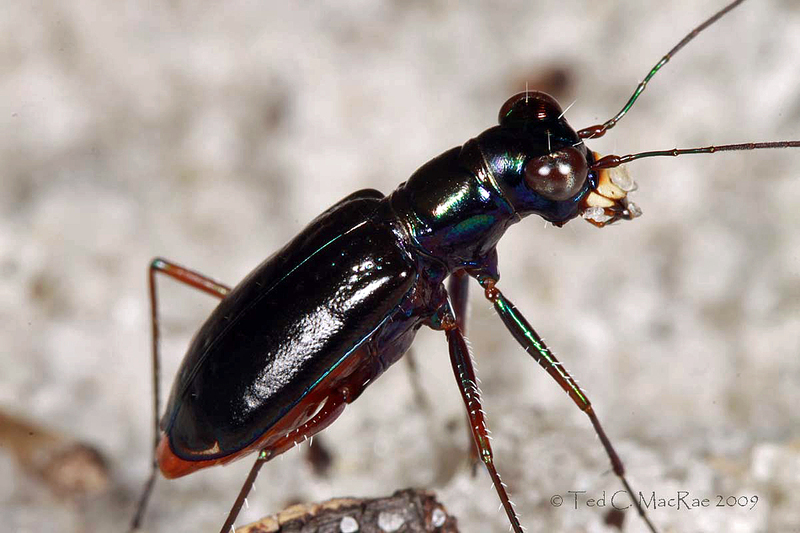 Cicindela highlandensis is one of Florida’s rarest endemic tiger beetles, being restricted entirely to remnant sand scrubland and pine woodland habitats along the Lake Wales Ridge of Polk and Highlands Counties in central Florida (Choate 2003). The Lake Wales Ridge represents former shorelines deposited when the rest of peninsular Florida was covered by seas. The quick draining sands have created desert-like open habitats dominated by oaks, pines, and other drought-tolerant species. Cicindela highlandensis is one of many plants and animals endemic to the Lake Wales Ridge, which has the highest concentration of endangered plants in the continental U.S. Unfortunately, the natural communities found on the Lake Wales Ridge have suffered severe reductions from their historical occurrence. An estimated 85% of the scrub and sandhills has been converted to citrus groves and urban developments, and the few remaining tracts face not only continued development pressure, but also the threat of degradation from reductions in the frequency and extent of the wildfires that are essential for their maintenance (Turner et al. 2006). NatureServe (2009) estimates that C. highlandensis populations have declined by as much as 90%, and only a few of the sites where it is known to occur are large enough to sustain viable populations. While the species has a global status of G1 (critically imperiled) due to its limited range, restricted habitat, and very small population size, and is a candidate for listing as an endangered species by the U.S. Fish & Wildlife Service (Pearson et al. 2006), it remains—bafflingly—unlisted even as threatened by the State of Florida. As a result, there is no formal conservation management plan for this species to ensure its survival. Fortunately, the largest populations of C. highlandensis occur on an assemblage of public and private lands that are under partial to full conservation ownership, and preservation/management activities are taking place at most of these. I had debated whether to look for Cicindela highlandensis at all—not because I wasn’t anxious to see it, but because I lacked confidence that I would be able find it. A late season search for a rare species had all the hallmarks of a potential wild goose chase. Nevertheless, I like a good challenge, and I had succeeded in obtaining information about specific locations for the species (a matter of public record; however, I prefer to maintain some discretion in this venue). Although I began my search with tempered optimism, it didn’t take long for me to acheive my goal. Similar to my experience with Cylindera celeripes in Oklahoma, I had barely walked ten yards into a gorgeous sand scrub habitat at the first site I had planned to search before I saw an individual. The dark metallic blue coloration of the species would seem to make it easily seen in its white sand environs; however, in reality it is almost impossible to see until it moves. Some have suggested that its coloration functions to make the beetle resemble the many small pieces of debris that litter the sand surface—perhaps the bits of charred wood that are common in open, fire-mediated environments. Its dependence upon natural disturbance factors such as fire was made apparent to me by the distinct preference I noted for adults to congregate along trails kept open by human disturbance, and to a lesser degree in the larger, naturally open scrub areas. The adults made very short escape flights and were easy to follow but difficult to approach closely enough for photographs due to extreme wariness—their long legs giving some indication of their highly cursorial capabilities. Cicindela highlandensis is closely related to two other species of tiger beetles in Florida—C. abdominalis (Eastern Pinebarrens Tiger Beetle), widely distributed throughout the Atlantic and Gulf Coastal Plain, and C. scabrosa (Scabrous Tiger Beetle), confined to the Florida Peninsula and adjacent southeastern Georgia. Both of these species are absent from the Lake Wales Ridge and, thus, do not co-occur with C. highlandensis. It is likely that C. highlandensis evolved from isolated populations of the widespread C. abdominalis that diverged during pre-Pleistocene separation of the Lake Wales Ridge from the mainland (Choate 1984). Despite its resemblance to both C. abdominalis and C. scabrosa, C. highlandensis can be distinguished from both of those species by the complete absence of flattened, white setae on the sides of the prothorax and the abdomen and by the highly reduced or absent elytral maculations (note the very small apical markings on the individuals in these photographs). All three of these species belong to the subgenus Cicindelidia (American Tiger Beetles) and possess red adominal coloration that is prominent during flight. Photo 1: Canon 17-85mm zoom lens on Canon 50D (landscape mode), ISO-100, 1/160 sec, f/13, natural light. Photos 2–3: Canon 100mm macro lens on Canon 50D (manual mode), ISO-100, 1/250 sec, f/14 (photo 2) or f/20 (photo 3), MT-24EX flash w/ Sto-Fen diffusers. Choate, P. M., Jr. 1984. A new species of Cicindela Linnaeus (Coleoptera: Cicindelidae) from Florida, and elevation of C. abdominalis scabrosa Shaupp to species level. Entomological News 95:73–82. Choate, P. M., Jr. 2003. A Field Guide and Identification Manual for Florida and Eastern U.S. Tiger Beetles. University Press of Florida, Gainesville, 224 pp. NatureServe. 2009. NatureServe Explorer: An online encyclopedia of life [web application]. Version 7.1. NatureServe, Arlington, Virginia. Available at: http://www.natureserve.org/explorer (accessed: November 12, 2009). Pearson, D. L., C. B. Knisley and C. J. Kazilek. 2006. A Field Guide to the Tiger Beetles of the United States and Canada. Oxford University Press, New York, 227 pp. Turner, W. R., D. S. Wilcove and H. M. Swain. 2006. 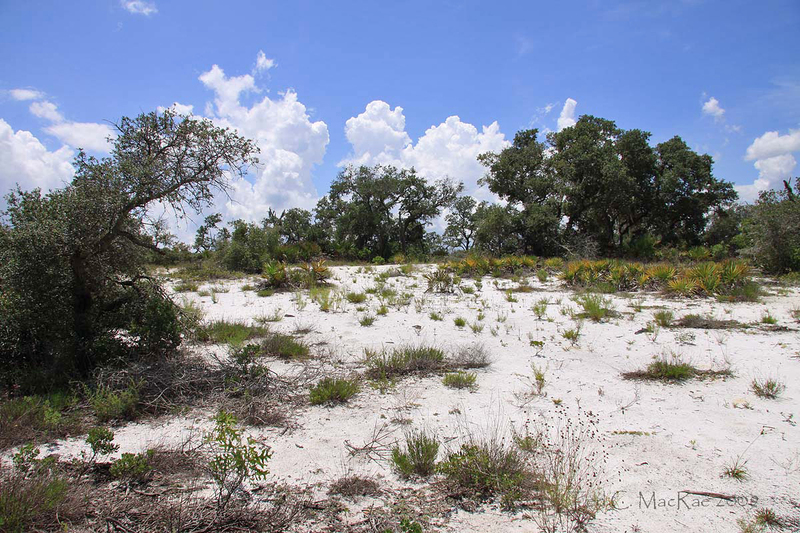 State of the scrub: conservation progress, management responsibilities, and land acquisition priorities for imperiled species of Florida’s Lake Wales Ridge. Archbold Biological Station, Lake Placid, Florida, iii + 44 pp. This entry was posted in Cicindelidae, Coleoptera and tagged beetles, conservation, endangered species, entomology, Florida, habitat management, insects, landscapes, nature, science, scrub, taxonomy, tiger beetles. Bookmark the permalink. Not being an entymologist I learn so much from your posts. Thank you. Is it possible that the role insects play in ecosystems does not get enough attention by ecologists? Hi Bill. Thanks, your kind remark is appreciated. You’re right, there is still much to learn about insect ecology. However, it’s no fault of ecologists, but rather a function of the staggering number of insects species out there – each with their own set of biotic associations. While it might be frustrating that we don’t understand things as well as we would like, making the effort to learn it is a lot of fun! What great luck on finding it without much trouble. And what a great find it is! Beautiful beetle. These shots are fantastic. The alert position is especially cool: long legs indeed. Do you know of any coordinated effort to get this species listed for protection? It sounds to me that the decision would be an easy one–assuming you can get beyond the commercial interests that no doubt keep it off the list (protecting it means protecting its habitat, and it sounds like the habitat is under threat from development). Hi Jason. The species was first petitioned for listing in 1991 (just a few years after it was discovered) and eventually received a priority ranking of “2” (“1” is the highest). In 2001, the ranking was reduced to “5” (“12” being the lowest) because the threat, though high in magnitude, was no longer considered imminent due to transfer of most of the remaining good quality habitat into public or other conservation ownership. Moreover, a 2004-2005 survey suggests that the status of the beetle has stabilized or even slightly improved since the last survey in 1996. The species remains petitioned for listing because of the magnitude of the threats it still faces (chiefly habitat degradation, vegetational encroachment, and potential for pesticide drift). However, a final ruling hasn’t been possible due to FWS staff and budget constraints resulting from their efforts on higher priority candidates. another great Cicindela post from your hand! Thank you. I love the image of it standing alert on stilts. It looks fragile and glasslike, and ready to dash to a speedy escape at the same time. Reading your posts I get the impression that you’re swamped in Cicindelas over there. We only have 4 species here.. maybe I should set out to see all four sometime next season..
Hi Nicholas – thanks for your nice comments. Yes, we do have quite a few tiger beetles here, especially when subspecific/geographical variation is considered. But the U.S. is a big country, and I did have to drive 1,000 miles to see this thing! Ah, of course. That does put things in perspective. With 1000 miles I should be able to find a few more species!